One of the best things about writing (publicly) about love–and I think I’ve said this before–is that people send me love stories. They send me articles and images and videos, and I have not yet gotten tired of receiving them. On Valentine’s Day in particular love stories abound, and they run the gamut from saccharine to sad; some are so full of the right kind of sweetness that my eyes go glassy on the bus ride home from work, and others are more like the middle-aged couple beside me at the bar tonight who dedicated their dinner hour to some heavy hand-holding. Later, I was unsettled to find them standing beside my bicycle and making out in that slow-yet-aggressive way that includes certain unconscionable suction noises that neither my loud jokes nor my flashing LEDs could modify. For most of today, I was content to read the love stories, the one about the nun and the monk, the letter from a wife to her husband’s student, the photo essay of marriages that survived half a century, even the dog and the box of chocolates. But on my bus ride home, tear-ducts prickling as I listened to yet another love story (what is it with tears and transit? ), it occurred to me that one who keeps a blog about love stories–and receives them via e-mail and reads them in between classes–ought to post a Valentine, even if at the eleventh hour. So here it is, friends, the most lovely of love stories I saw, read, or heard today (collected both on and off the bus). It includes lots of beeping, whirring and mechanical noises, but no suctioning, I promise. This is ostensibly a story about science (though the science itself seems a bit shaky, even by the researcher’s own admission). What really got me, however, was not the data gathered from the subjects, but the participants’ post-experiment radiance, their astonishment at their own capacity for love. After just five minutes spent meditating on a loved one in an fMRI machine, even those most infatuated seem to surprise themselves, as if the machine stuffed the love into their brains rather than measuring what was already there. By internet standards, it’s not a short video–about fifteen minutes long–so wait until you’re settled on the couch (or bus seat, as the case may be) with a bottle of beer and a dog at your ankles and a few minutes to yourself. It’s worth the watch, even if–especially if–you haven’t spent your day doing any heavy hand-holding. “It’s like skimming cream off the top of fresh milk,” J says. As he says this, he pivots on the balls of his feet, turning his heels from one side to the other, bending his knees with each turn and stabbing the floor with an imaginary ski pole in a perfect marching rhythm. On his face is this strange, faraway grin. He’s left the living room and is floating down a fresh powder slope, leaving a perfect single-helix trail in his wake. Laying trenches, the boys call it. They look at the snow forecast and giggle like school girls. Powder skiing is what my friend Kirsten would call type-1 fun. Like dancing ’til dawn or playing with puppies or eating my dad’s pulled-pork barbecue, every moment of a type-1 fun activity is intensely pleasurable. Type-2 fun typically denotes things that you don’t necessarily enjoy in the moment, but that you can look back on and say, “Oh yeah, that was fun,” things like camping in torrential rain or traveling by bus in some parts of the developing world. (When googling the term I found a blog that put it succinctly: “When you engage in type-two fun, you’re investing in your future self.”) But powder skiing, once you learn to make even two or three turns without bailing, is addictive, hypnotic. The satiny float of your skis on the snow, the momentary weightlessness as you straighten your legs. You crave it. The dopamine levels in your brain rise just thinking about it. And you find yourself engaging in all kinds of type-2-fun activities just to experience it. I took my first avalanche safety class last February, primarily because of a dawning awareness that I needed access to more powder skiing. 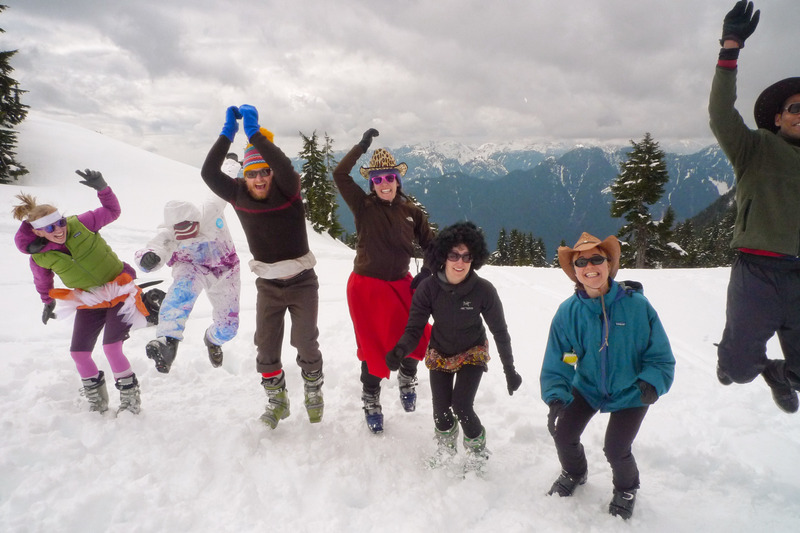 An avalanche safety class, especially on a day when the dumping gray snow obscures the tops of trees and soaks through to your long johns, is definitely type-2 fun. But I was up for it. The year before, my roommates–the boys who had titled our wireless network “powderhounds”–had spent the winter sniffing out the fresh powder in the British Columbia backcountry, and now I wanted in. I have this theory that most love stories actually do a terrible job of preparing us for the business of being in a romantic relationship. But despite this, we still love love stories. We tell them all the time. We hold them up to the light next to our own relationships. I love love stories. Personal experiences, family histories, fairy tales, cheesy romantic comedies–you tell it, I’ll listen. Cue up a Julia Roberts movie and I’m the one sitting beside you on the trans-Atlantic flight, glancing surreptitiously at your iPad and pretending my red, puffy eyes are the result of cabin pressure and a pretzel allergy. I once worked at a writing center with a Joan Didion quote on the wall that read, “I write entirely to find out what I’m thinking, what I’m looking at, what I see and what it means. What I want and what I fear.” I’d been writing essays about rock climbing, or caffeine, or medieval martyrs, but somehow each piece snuck back around to this one fact: I fell in love. Every day I looked at that quote and I grew increasingly worried about what it might mean for me. Love scares the crap out of me, but somehow I’d spent my life wanting it. If I didn’t tackle it head-on, I might never stop writing about it. I was used to being good at things, but love? Love was too smart for me. It was the roadrunner and every time I tried to catch it, I threw myself off the cliff with the anvil. I wanted to know why love wasn’t easier. And why something that was a fundamental biological drive could feel so utterly unintuitive. Well, I for one blame the messenger. Love stories, you’re in my sights. One day, this will be a book. In the mean time, it’s a hot mess of Word documents, and, now, a blog!